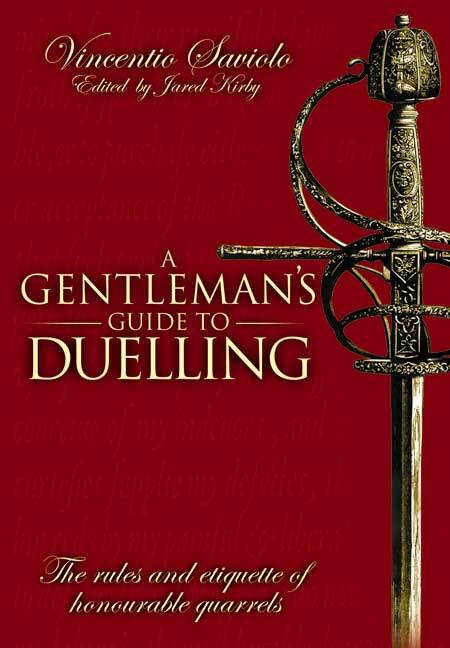 You'll be £19.99 closer to your next £10.00 credit when you purchase A Gentleman's Guide to Duelling. What's this? Order within the next 2 hours, 59 minutes to get your order processed the next working day! A Gentleman's Guide to Duelling is a beautifully illustrated, lyrical guide to duelling etiquette in Elizabethan England. Its author, Vincentio Saviolo, was one of the great Italian fencing masters and a contemporary of William Shakespeare. In the 1590s, both Saviolo and Shakespeare were based in London's Blackfriars; and Shakespeare used Italian fencing terminology in Romeo & Juliet which was written shortly after Saviolo's book was published. Originally published under the title Of Honour and Honourable Quarrels Saviolo's guide is devoted to the art of settling a duel in a gentlemanly manner. It was written in a time when honour, virtue and codes of behaviour were of grave importance; and rapier play was seen as ideally suited to the requirements of a gentleman. This new edition has updated the Elizabethan language to modern British English in order to make it more accessible to today's reader and includes explanatory annotations. Preceding the guide is the most comprehensive biography on Saviolo ever compiled: many suppositions and misnomers have been spread for hundreds of years and Kirby has gone back to the primary source material to finally uncover the truth about Vincentio Saviolo. I really enjoyed the book and was also excited by the section on trying to find the school Saviolo ran. Next time I am in London I am going have a look around the area and look for the Red Lion sign – read the book, you will know what I mean. For HEMA-ists – this is a book of context for the period rather than footwork and combat techniques, for reenactors – this is a great book to help set up a scene for the period and maybe even some mock duels. Kirby's book will be a welcome addition, not only to collections on sword, rapier or duel techniques in the sixteenth and seventeenth centuries, but also to any of those interested in the culture and the concept of honour in the period more generally. It may also find its way onto the shelves of more than one Shakespeare and Elizabethan Drama scholar. Saviolo’s concepts of virtue and honour are as relevant today as they were in the 16th century. This modernized version of Saviolo’s book is easy to read and puts an important work back into circulation. This work is as relevant today as the day in which it was first published, and is a much-needed and refreshing elucidation of moral principles that sadly have been discarded by modern society. This republication is a must read for anyone that truly desires to better comprehend the socio-cultural environment of the Renaissance era which is the cradle of European Historical Martial Arts. An excellent reference tool for scholars and a wonderfully practical one for historical fencers, fight directors and actors seeking information or inspiration on swordplay in the 16th century. A humorous and instructive guide to Elizabethan etiquette which should interest gentlemen of any century.